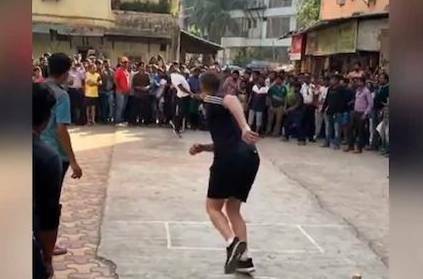 One of the world's fast bowler of all time, Australia's Brett Lee and West Indies's great Brian Lara were recently captured playing gully cricket on the streets of Mumbai. Both who are part of the expert broadcast panel for the Indian Premier League (IPL) 2019 took time out from the hectic schedule to indulge for a gully cricket clash. Brett Lee, who posted the video on his Instagram account stated that "he (Brian Lara) has still got it." In the video that is viral, Brett Lee revived his playing days to bowl a sharp bouncer at Brian Lara, who swayed out of the way of the delivery. In another video posted by the Brett Lee, he can be seen bowling an inch-perfect yorker to a local guy which went on to rattle the stumps. Talking about the next IPL 2019 match - it will be between Kolkata Knight Riders (KKR) and Delhi Capitals (DC) at the Eden Gardens today. This page contains news relating to various facts and events. The views are generally about current affiars and general topics in diversified areas such as political, international, national, and regional issues, sports, health, travel, lifestyle, technology and business. People having similar interets on the above topics will find this page useful. Video Viral: Brett Lee Bowls Bouncer At Brian Lara In Gully Cricket | Sports News.